This series of CNC machines is a submission to the HackadayPrize2016. You can find my project on Hackaday: Self replicating CNC for 194 (or more) countries. I made it to the Finals of HackadayPrize2016! Thanks for following my project, for each like and for sharing your thoughts! The promotion video recorded for this year's HackadayPrize. If you think this project is worth spending some money to compensate for the time and money I am spending to turn things into something of value to you and the global community, I am asking for your support by making a small donation to help with my costs on this project. Please click the "Donate" button on any one my pages to help further and support the global community with me, as I am working hard to enable and educate anyone looking to benefit themselves. 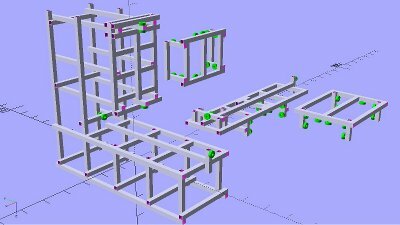 For the first time I have designed a CNC using CAD software. The program of my choice is OpenSCAD, since I prefer typing source code over clicking on a colored desktop with a mouse. The framework is based on steel square tubes of the dimensions 20x20mm with 2mm thickness. Here you can get the OpenSCAD file. In this video I am having a close look at the accuracy of my DIY linear drive using a dial indicator. Using the printhead sensor from an old inkjet for a DIY linear drive is demonstrated in this video. 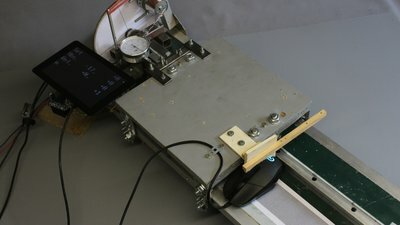 In this video I am using an optical mouse as linear sensor. Error when going to a point from right: 20μm at a drive distance of 2x 300μm, 30μm at a drive distance of 2x 600μm. Driving to one point from right with low speed on return path: -130μm deflection to the left. Driving to one point from right with changing speed on return path: 20μm deflection to the right after the first run, 140μ deflection to the right after 15 runs. Driving to one point from right with changing speed on return path: 10μm deflection to the right after the first run, 100μ deflection to the right after 15 runs. I had another run with the mouse mounted in X direction of the optical sensor pointing to carriage movement. Error when going to a point from right: 10μm (deflection to the right) at a drive distance of 2x 300μm, -10μm (deflection to the left) at a drive distance of 2x 600μm. Driving to one point from right with low speed on return path: -220μm deflection to the left. Driving to one point from right with changing speed on return path: 20μm deflection to the right after the first run, 180μ deflection to the right after 15 runs.